Joss Whedon likes to keep busy. In 2007 when the Hollywood writer’s strike forced most of the films and TV shows to stop production, Whedon financed, wrote, produced and shot a little web movie called Dr. Horrible’s Sing-Along Blog. The forty two minute musical tragicomedy went on to win The People’s Choice Award, a Hugo and an Emmy. Then in 2011, in a twelve day hiatus between shooting and post production on The Avengers, Whedon got all his friends together and filmed a feature length version of Much Ado About Nothing. The film was adapted, produced, directed and edited by Whedon and he also wrote the music. Since then he has launched the Marvel Agents of SHIELD TV show and brushed up the script for In Your Eyes, all the while planning and preparing for the now shooting Avengers sequel. The thing is though that both Agents of SHIELD and In Your Eyes seem like they needed a little more work. Up until recently, everything Whedon has done has been excellent but it is possible to look at these latest projects and think that perhaps Joss Whedon is finally over stretching himself. Problematic as these two productions are though, I don’t think this is necessarily the case. They are not the flawed efforts of an overworked control freak, quite the contrary. They are the product of Whedon using his name to give other people opportunities. That isn’t to say that Agents of SHIELD and In Your Eyes just have Whedon as some kind of executive producer. His contribution is far greater than that. He is co-creator and sometime writer/director for SHIELD and the screenwriter of In Your Eyes but the fact is they are really someone’s else babies. 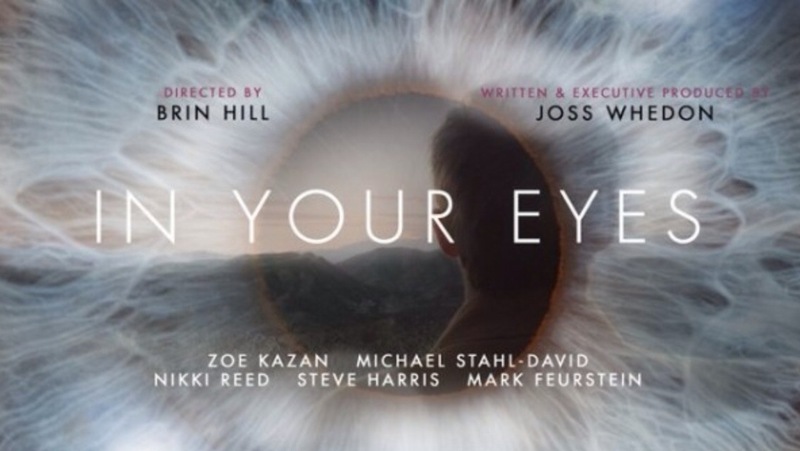 Whedon’s brother Jed and sister in law Maurissa Tancharoen are show runners for the Marvel series and In Your Eyes is directed by Brin Hill. The mark of Whedon is there in their genesis but they have been taken in different directions by someone else’s creative vision. Joss Whedon’s involvement has been used to sell the projects though and that is no bad thing. The big budget, Disney backed SHIELD show was undoubtedly given a boost by the director of The Avengers being a part of it although interestingly this it may also have unfairly raised expectations. I spent a lot of time writing about Marvel’s Agents of SHIELD when the series started (search for it on the blog if you’re interested) but gave up after episode 8. I had so desperately wanted the scripts to be full of rounded characters and great Whedon one liners and for the series to tell stories linked with the Marvel films but when it missed some great opportunities to deliver on this, I decided to stop dedicating time to it on the blog. I didn’t stop watching though and ten episodes later the show has pretty much become what I’d wanted it to be. Some of the main characters are still a little less engaging than you would like them to be and Agent Coulson, so cool in the films, is clearly not as enigmatic now that we know him better but the episodes have become quite exciting and are tightly linked to the Marvel Cinematic Universe. Following the huge shake up in the shows titular organisation, the Strategic Homeland Intervention Enforcement and Logistics Division, in Captain America: The Winter Soldier, the show has provided great detail on how this has affected other people within that world. You remember in Austin Powers, where every time a throw away henchman is killed it shows you the implications of this for his family and friends? Well, this is that same idea writ large. Every SHIELD episode is now like a forty minute deleted scene from Captain America 2. The Whedon connection particularly benefits In Your Eyes. Hill’s film is the second, after Much Ado About Nothing, to come from Bellweather Pictures. This production company was started by Joss and his wife, Kai Cole, specifically to support micro budget films and distribute them outside of the usual studio system. Michael Stahl-David and Zoe Kazan play Dylan and Rebecca. You might recognise him from Cloverfield but if you don’t recognise her from Ruby Sparks then you need to get a copy of that glorious film and watch it right away. The two characters live two thousand miles apart but are joined by some sort of unexplained telepathic connection. It is a nice idea, engagingly executed but there aren’t really any of the sharp script moments we have come to expect from Whedon’s pen. Whedon is a master at puncturing or overturning genre conventions but In Your Eyes is actually a fairly standard romance. The central conceit is an interesting one, it probably isn’t explored to its full potential. What the film does have is two very endearing performances from the leads. They have really good chemistry despite not actually being together and easily carry the viewer through the one hundred minute running time. Kazan is especially captivating and with this and Ruby Sparks (which she also wrote) is an actress to watch out for. The cast doesn’t include anyone from Whedon’s other projects which you usually see but it does have Jennifer ‘no one puts Baby in the corner’ Grey who is the wife of Clark ‘Agent Coulson’ Gregg, so that’s close. Also in its favour, the film does keep you guessing a little. As a long time lover of Shakespearean comedy, Whedon knows that the difference between sweet and bitter lies in the denouement and it is satisfyingly unclear, as In Your Eyes develops, whether the film will end well or tragically. Interestingly Joss Whedon originally wrote this screenplay in 1992, when he was 28. It is tempting to let this explain the absence of his normal sophistication but he had already created Buffy by then so that probably isn’t right. The thing that is perhaps most interesting about In Your Eyes, and the area in which it bucks convention, is the manner in which it is being distributed. Immediately after the film’s Tribeca Film Festival premiere Joss Whedon himself announced that the movie would not be getting a cinema release but would immediately be available for home viewing via Vimeo, the video sharing website. Anyone who goes to inyoureyesmovie.com can instantly rent it for $5 or just three of your English pounds. Of course Whedon shared this via video. He wasn’t there to say it in person, he is far too busy for that.